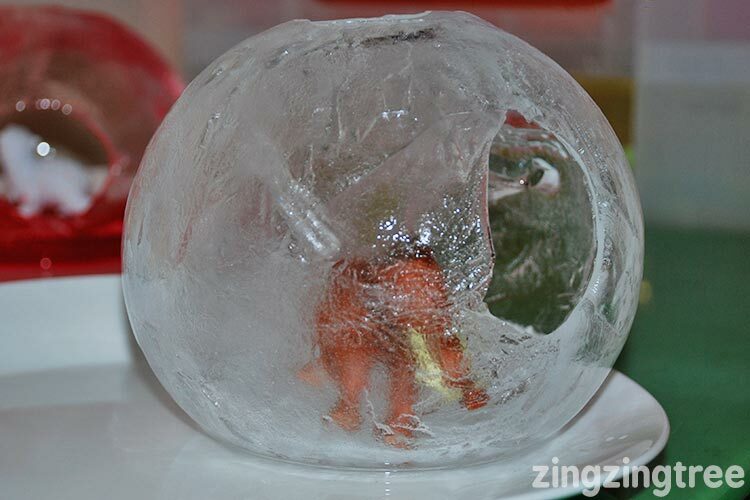 I remember the day when I found these really cool ice balls on pinterest and thought I’d try and make them in my freezer for the girls to play with. I was a bit impatient so went to investigate a bit early and was so excited when I found they were frozen! 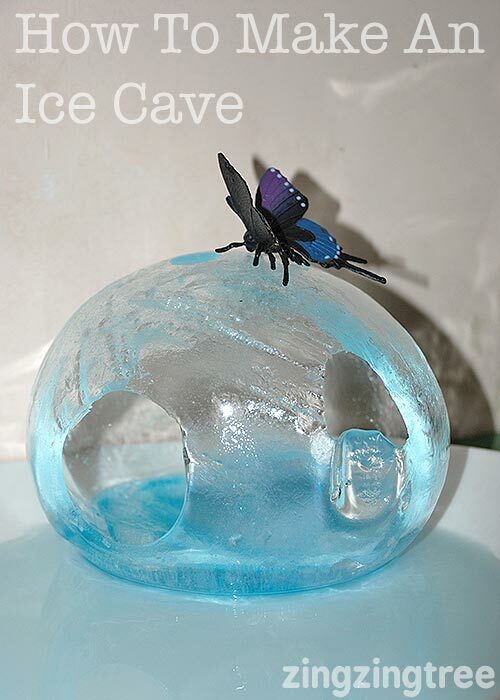 As it turned out they weren’t quite as frozen as I’d thought and a huge pile of water escaped from the one I was peeling the balloon over but to my exasperated surprise and utter excitement I found I’d made something so much better…Ice Caves. Balloons, water, liquid food colouring (do not use paste) and a freezer although if the weathers cold enough you could try leaving them outside. 1. Take a balloon and add about 0.5-1 tsp of food colouring depending on how big a ball your making or how strong you want the colour. 2. Next fill the balloon with water and tie a knot in the end. 3. 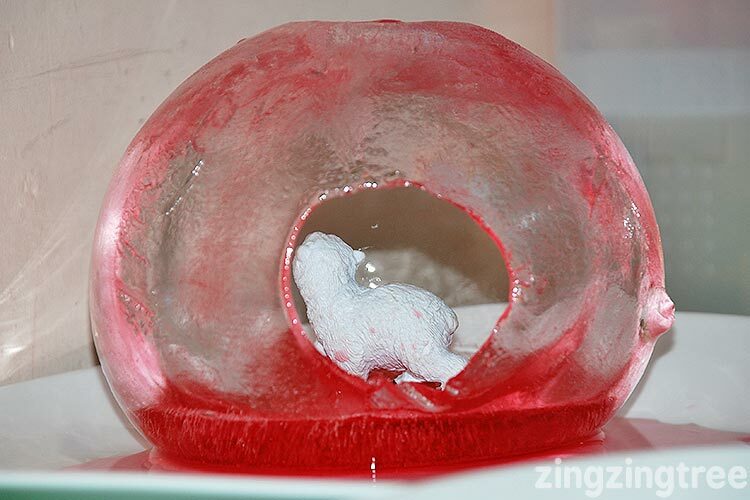 Put the balloon in the freezer and leave for 5-6 hours. 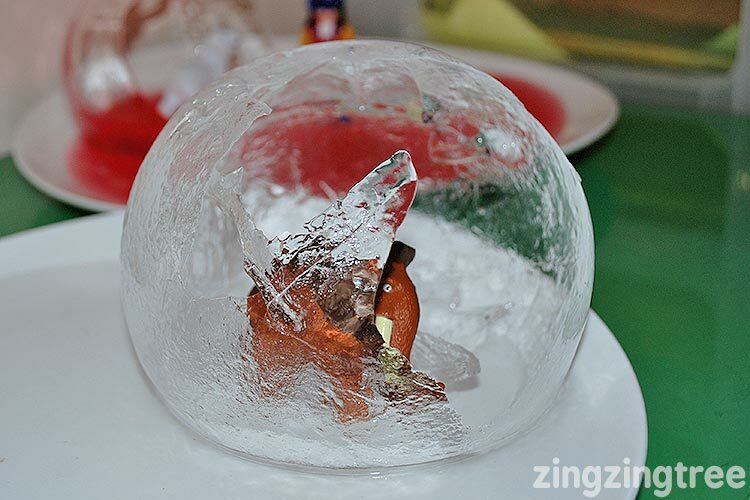 Take the balloon out when it is solid enough on the outside to give a squeeze without breaking and there is still water swishing around inside. You may need to adjust the time depending on how big the filled balloon is, so keep checking. 4. Over a sink carefully pull the balloon away. Depending on how thick the ice is you should get a natural break hole in the ice as the weight of the water causes the ice to break. This hole or two provides just enough space to add little toys. 5. 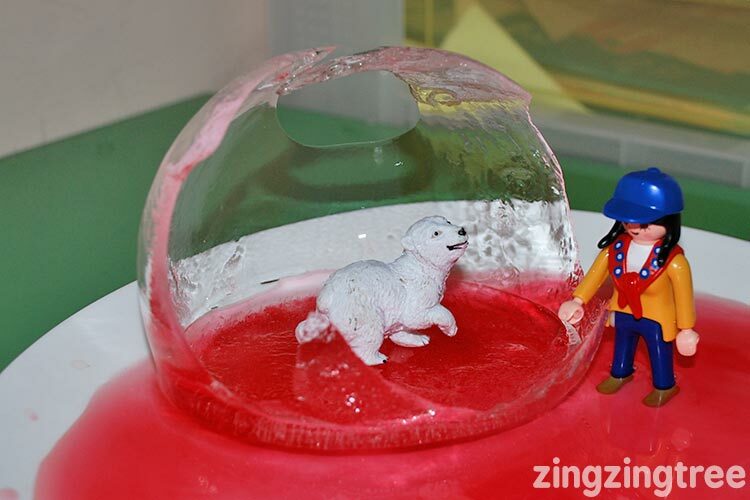 Because the food colouring wasn’t stirred in and is denser than water it will sink to the bottom of the balloon forming a beautiful coloured base to the cave. They made fantastic homes for the girls Playmobil and plastic animals. Which was constantly changing as the ice melted. 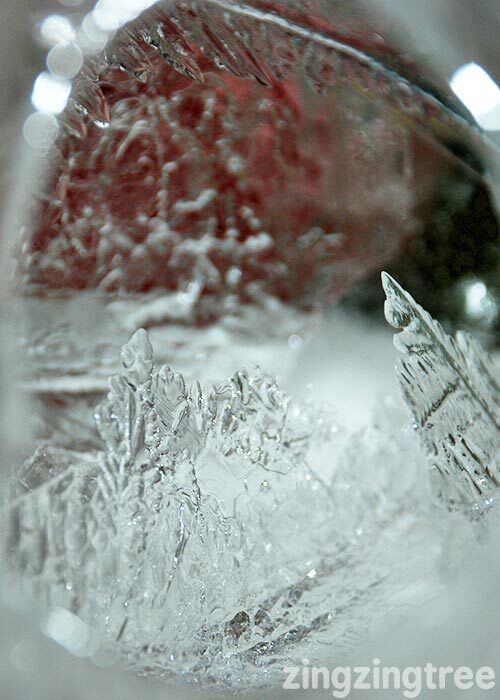 If you’re really lucky you might even get to find some ice crystals inside like we did with the clear Cave. 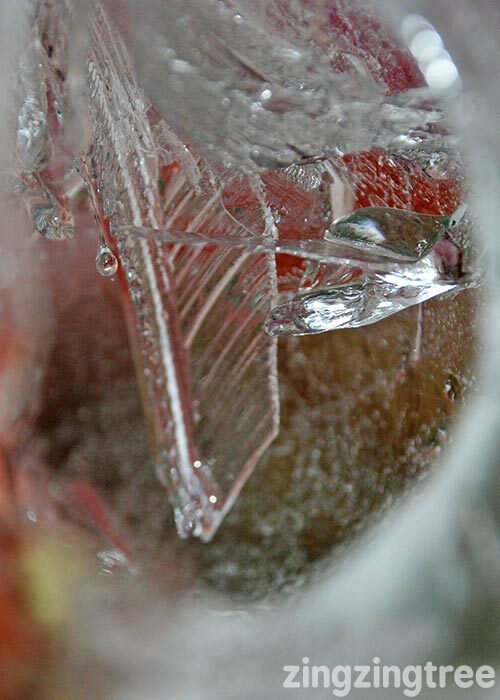 Their jagged shapes jutting up from within the Ice cave like big icy knives. Wow, that is fantastic! much better than a solid ball! What a genius idea! I love that. 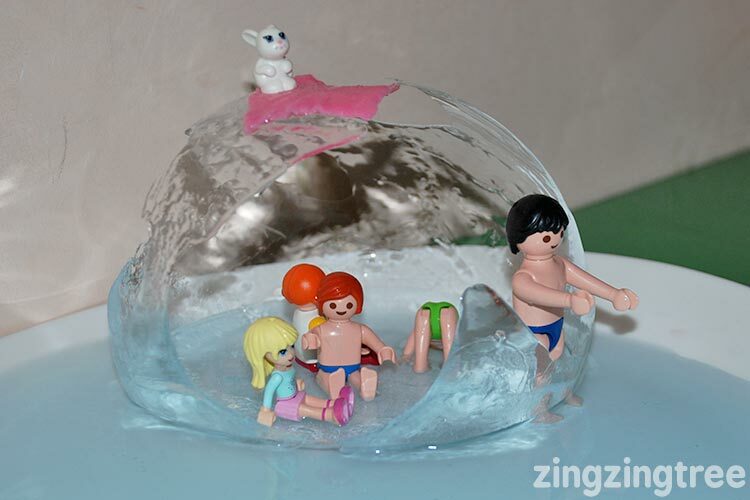 Definitely one to try with the kids, especially as we’ve had no snow to play with down here… A perfect alternative! This is so cool! I haven’t seen anything like it and want to try it with my kids. Thanks for sharing your tutorial. We are from Texas, so seeing anything remotely similar to a real ice cave is… well, impossible. They’d look great outside if you have the weather. We had a dismal visit from the Snow Spirit this year. only hung around for 2 days. It was very disappointing. Looks like lots of fun!! The toys just look “so happy there”. This is one of the neatest things I’ve seen in a long time! Excited to try it! Great idea, i’ve pinned, just need enough room in the freezer! 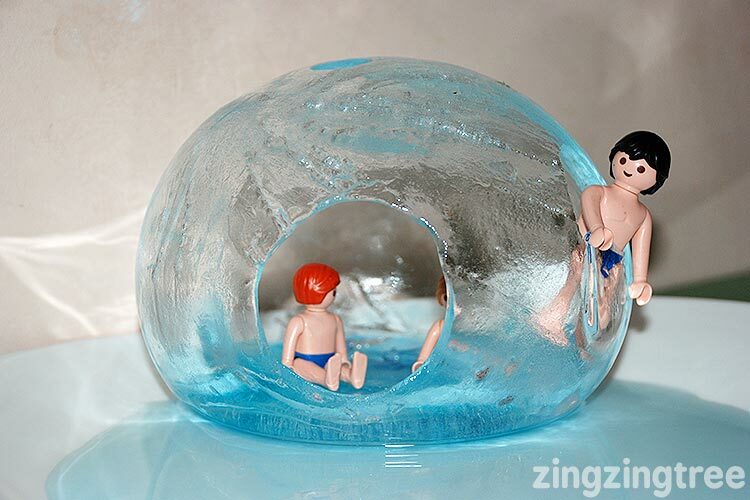 I completely failed to make ice marbles with The Boy so I think I’d have to try these in the freezer and take them out before they’re completely frozen. Brilliant idea though. My kids would love this! Visiting from Project Inspire. Oh, how neat!! 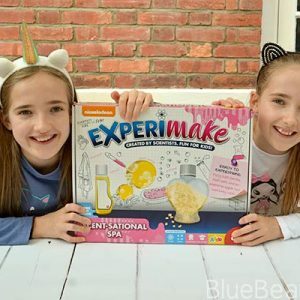 What a fun thing to create and play with. Thank you for sharing at Sharing Saturday!! So cool! Love your ice cave! What as great idea! I know my kids would enjoy this, particularly as they miss living somewhere with a proper winter. Beautifully done! We are trying this for sure!! !